KakaoStory is a photo sharing social networking service for KakaoTalk users. - Photo filter lets you add mesmerizing image effects to photos. 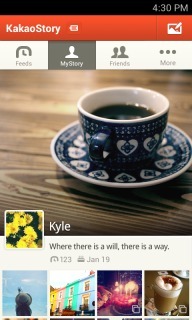 - You can view friends&rsquo; latest updates in &lsquo;Feeds&rsquo; tab. - Express your emotions on friends' stories using 5 different emotions available. - Import all your KakaoTalk friends to KakaoStory. - Sign in with your existing Kakao ID. If you do not own Kakao ID, then simply register with your name and an email address. - When you set your background image or upload photos in KakaoStory, the images will be shown on your KakaoTalk&rsquo;s mini profile. Skype Free IM & V..
KakaoStory For Android Phones ..